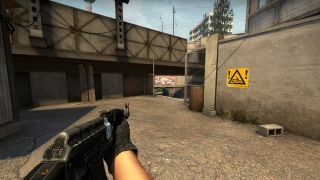 Learn to control CS:GO's most important weapon. If you’ve ever played Counter-Strike: Global Offensive you’ve probably noticed that assault rifles are the weapons of choice for most players. The reasons are many. Not only do they look cool, but in the right hands they can turn the tide of any game. In this article I’ll show you how to use assault rifles and hopefully it’ll help you win more games on your road to the Global Elite. Why should you use assault rifles? The short answer is that, together with the AWP, they’re the best weapons in the game. They’re accurate and have great armor penetration, making them the foundation of CS. Pistols, SMGs and sniper rifles are used in different and very specific situations: in most rounds you’ll find yourself using assault rifles. Which assault rifle should you use? By far the most popular ones are the AK-47, M4A4 and M4A1-s, the latter being subject to a massive overhaul late last year. In an update in which many (including myself) thought the weapon would be rendered useless, both the M4A1-s’ armor penetration and rate of fire was lowered. The lowered rate of fire proved to make the weapon more accurate: it’s a lot easier to control the spray than before. This, coupled with the fact that it has a silencer, has made sure the weapon is still being used even at the highest level of competitive CS:GO. If you can’t afford one of the above mentioned weapons you can go for the FAMAS (CT) or the Galil AR (T) if your team decides to go for a buy round. They’re both pretty accurate and has decent damage output. They are however inferior at long range and marginally worse at close range. If you learn how to control the recoil of the most popular assault rifles you have a greater chance of coming out on top when it really matters. Teamplay might be an integral part of Counter-Strike, but you’ll never reach your goals if you don’t know the basics. And your work is never done. You need continuous practice if you want to maintain your skill level. Let’s start with the T-side weapon of choice: the AK-47. This is what the spray looks like if you don’t try to control the recoil. What can we make of this? Notice how the first two bullets go pretty straight. After that the bullets start gravitating towards the sky and to the left. After a while the pattern goes to the right and stays there for a while before it goes back to the left. Practice to move your mouse to counter the recoil and you should end up with something like this. Let’s take a look at the M4s. The M4A4’s recoil pattern makes the bullets go straight up, then to the left, back to the right and then left again. Here’s how it looks both when you just hold down the trigger and when you try to control it. The M4A1-s’ pattern is basically the same except it’s a bit slower, and obviously stops after 20 bullets instead of 30. As you might know there are a few different techniques you can use when you shoot. There’s the famous one-taps á la ScreaM, the short bursts and then spraying. But when should you use each technique? As a rule of thumb you should almost never go for one-taps with the M4s because of how accurate the first three bullets are. Instead you should go for short bursts at long and medium range. With the AK-47, things are a little bit different. One bullet to the head and you’ll score a kill. Therefore a few quick one-taps can do the trick at long range. At short range it’s almost always best to go for sprays. If you’re good you can do some serious damage at medium range as well. That’s all individual and what works for one player might not work for another and the other way around. One small piece of advice is that it’s one thing to spray on a wall and another thing to spray down moving targets. Like Jordan ‘n0thing’ Gilbert said on his stream, the most important part of spraying is to get the height right. If you can do that you’ll find more success when you try to spray someone down. I suggest that you take a few minutes to watch this clip. In the video he talks about how important the first few shots are. A big part of mastering any weapon in CS:GO is to aim properly. Subscribe to a map called training_aim_csgo2. Practice on different distances. The main reason for this kind of practice is to get used to your sensitivity. I recommend that you turn off mouse acceleration. That way you’ll be more consistent. If you can make things easier for yourself you should. I’d also recommend a fairly low sensitivity. Even if one might argue that it’d be better to learn how to master high sensitivity it’s not realistic. Especially on long range and when you have to react really fast. The lower you go, the more precise you’ll be. Even if you have really good muscle memory you won’t be able to land those insane headshots under pressure if your sensitivity is too high.